We are awash today with visions for the university of tomorrow. Everyone will have a cloud-based robotic tutor on a tablet, which will curate everything we need to know. Six-week short courses or coding academies are all we will require. The world of education will be all digital and individualized, allowing you to learn from your laptop from anywhere on-demand. There is just one problem with these visions: they miss the mark on what students need to learn to succeed. In the Fourth Industrial Revolution, universities and companies face numerous shifts, from emerging technologies like autonomous transportation to broader social changes like the growing global middle class. The World Economic Forum’s Future of Jobs report highlights how these trends are transforming the workforce. The top trend in the report, though, is the changing nature of work. Work today is increasingly collaborative and focused on solving complex problems in creative ways. Work is also more trans-disciplinary than before: just look at how Google hired psychologists to help coders design fonts, and anthropologists to better understand how their users think and behave. The problem is that none of these skills are easy to learn alone, online, or without effort. They take practice, and they demand rich, human interactions. We learn to be complex thinkers, to manage relationships, and to be emotionally intelligent by practicing those skills, with others, on problems big and small. The Fourth Industrial Revolution is also bringing us a new meta-trend: a faster pace of change. 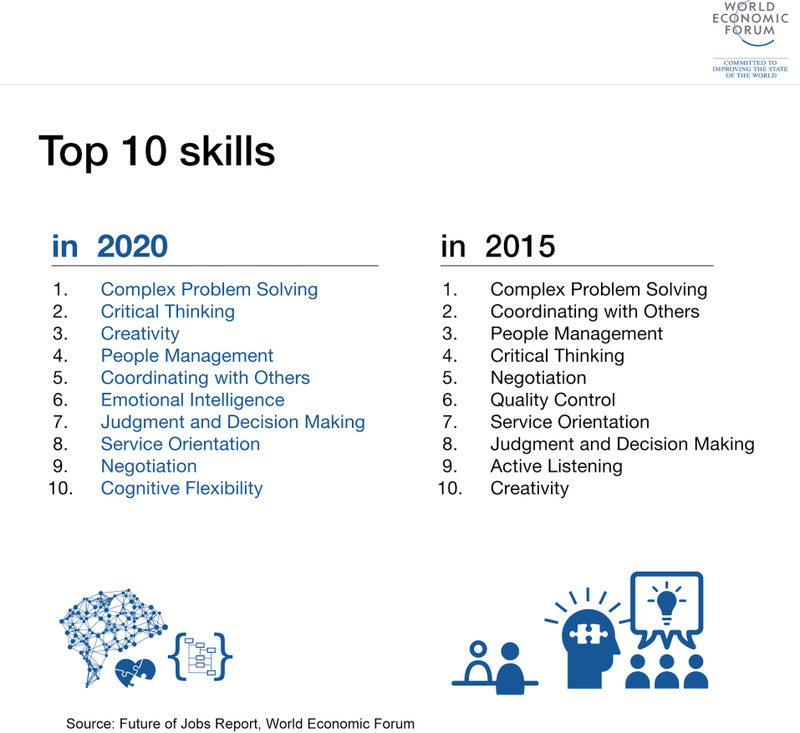 There is no doubt that technological trends and the list of skills above will continue to shift over the next five years. Adaptation will be the order of the day. Workers at all levels will need to continue learning new knowledge and gaining new skills throughout their lives. So what does the university of the future look like, and what does it do? First, the university of tomorrow will focus on imparting cognitive and cross-functional skills, like critical thinking, creativity, collaboration, and complex problem solving. Students will learn by combining studies with practical application, such as internships, applied “laboratories” for both STEM and non-STEM courses. Models such as cooperative education, with alternating semesters of study and work experience, will spread further from those countries – including Australia, Brazil, Canada, Germany and the United States – where it is already a common educational practice. New models, like design workshops, will also continue to grow and flourish. 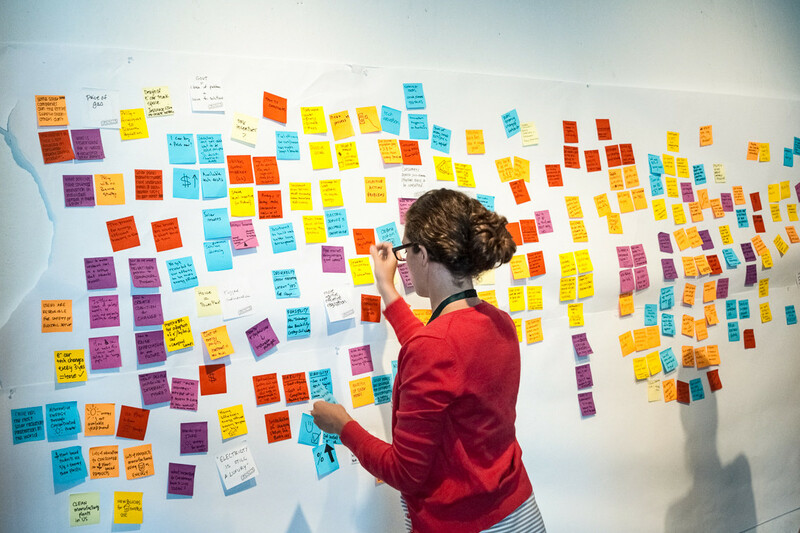 Stanford’s cross-disciplinary design workshops on topics such as how to improve the healthcare system are one model. The Institute for Design and Public Policy, created by the Rhode Island School of Design and the US Department of State’s Bureau of Educational and Cultural Affairs, is another. The university of tomorrow will also focus on “learning to learn”. Learning is a lifelong process, and with today’s pace of change, everyone will need the tools to learn throughout life. “Grit” or persistence lies at the heart of the lifelong learning process, so university educators will push students to develop the resilience to master challenging material outside the classroom. Universities may push for more guided research, require students to complete a capstone or thesis (as many already do), or develop new options entirely. Regardless of discipline, universities will try to instil foundational skills, such as how to find new sources of information, seek out experts and formulate effective questions. Two current examples are the explosion of interest in information sciences and the increasing use of information sciences techniques in many disciplines. Education technology has a role. But its role is to support the learning process, not to supplant it entirely. Education technology can deliver content or provide research tools. It can even help educators track and identify individual students’ weakest areas. Many education technology companies are pursuing these goals already. Yet the core skills of tomorrow demand richer, deeper human interaction as students learn. William Gibson said: “The future is already here – it’s just not very evenly distributed.” This is particularly apt for the future university: many universities already offer many or all of the educational elements described above, and most are not new. Cooperative education started over a century ago in the United States. The first “lab” classes in the social sciences are decades old. Teaching the use of good questions to refine thinking is an education practice that dates back to Socrates. Even new models, like the design workshop, have been around for more than a decade. Yet many universities do not use these models at all, while many others cannot or do not offer them to every student in every discipline. The task ahead is to make these learning experiences more universal and accessible. We are long past the days when complex problem-solving and creativity were only being taught to a few leaders at the top or to students at only the most elite universities. If we are going to make the most of the Fourth Industrial Revolution, we need everyone to reach their full potential, whether leader, manager, employee, artist, or entrepreneur. Many of the tools we need are already here. It’s on us to put them to good use. The author is a Global Shaper in the Washington DC Hub. The Annual Curators Meeting of the Global Shapers community is taking place in Geneva, Switzerland from 19 to 22 August.